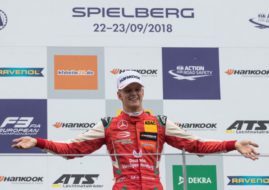 Maximilian Günther (Prema Powerteam) is the winner of two Sunday’s races at Pau Grand Prix, the third round of the 2017 FIA Formula 3 European Championship. Lando Norris started both races from pole but he didn’t succeed to convert it into wins. He finished second in the Race 2 and crashed out in the Race 3 while leading. In the second race at the 2.76 kilometres long street circuit of Pau in the south of France, Gunther stole the lead from polesitter Norris before the first corner and after that he managed to defend his position from numerous attacks. Callum Ilott (Prema Powerteam) crossed the finish line in third place ahead of Harrison Newey (Van Amersfoort Racing), Ralf Aron (Hitech Grand Prix) and Jake Hughes (Hitech Grand Prix). Joel Eriksson (Motopark), who started the race as the championship leader after Saturday’s victory, retired early after an accident. That allowed Norris to get past the Swede into the lead of the drivers’ standings. Norris had a chance to extend that lead with a victory in Race 3, leading from the start until lap 19. Then he crashed into the wall, handing another victory to Maxi Gunther. Callum Ilott made it a 1-2 victory for Prema. Ralf Aron finished in the third place, scoring his first podium of the season. Harrison Newey was fourth, ahead of Joel Eriksson. After nine races, Eriksson and Norris collected 139 points, just two more than third-placed Günther. The next round of the championship is scheduled for June 17-18 at Hungaroring.